February is Heart Health Month here at the ProActive Centre. We’ve been hard at work finding different ways to help improve our heart health, which is perfect timing to follow the New Year’s resolutions we set back in January. Over the years we’ve seen so much research showing how important physical activity, diet and nutrition is to our overall health and heart health. Recently, research is starting to show how having a healthy heart can actually help us improve our psychological health too. Heart Rate Variability (HRV) is a new dynamic measure showing how our heart can respond to different life events and stresses, such as positive happy emotions or negatively feeling stressed out. As the picture shows our heart is more stable and slower when feeling calm, relaxed and positive, whereas when feeling stressed out, anxious and angry our heart rate begins to increase, become more erratic and it fluctuates more often. Once we have completed a quick measurement of HRV we are able to assess how efficient our heart is in reacting to these different scenarios. Higher HRV scores mean that our heart is more capable of reacting to the negative experiences and quickly attempts to smooth out our heart rate back to normal. Lower HRV scores mean that our heart is less adaptable and reacts to life experiences slowly. However, all is not lost, Heart Rate Variability can be trained! What is Heart Rate Variability Training? HRV training is a fairly new training protocol that was created within the Sport Psychology world to help athletes regulate their heart rate and breathing during intense competitive stress. HRV training has now been found to work for many other environments as well, such as test taking, job interviews, relaxation, and researchers have even found it to help cognitive anxiety, and depression. So what’s involved in HRV training? Well the first step is to use a simple heart rate monitor strap in combination with a smartphone app that allows us to get a baseline measure of HRV. Once we have an individualized HRV score, we begin a 20 minute guided breathing training program that will help to keep our breathing at a slow and relaxed pace. Practicing proper breathing is a logical method to mimic a calming and relaxation sensation which will help to increase HRV. Researchers have found that when practicing HVR training at least once a day over three months resulted in improvements to the adaptability of the heart and baseline HRV scores. HRV is one of the tools we can use to assess and improve your performance, training or anxiety levels during a Mental Performance Training Session. These sessions are offered one-on-one here at the ProActive Centre, and can be helpful in identifying and addressing performance issues at school, on the job or while competing and training for sports. Paul, M., & Garg, K. (2012). The effect of heart rate variability biofeedback on performance psychology of basketball players. Applied psychophysiology and biofeedback, 37(2), 131-144. ‘Tis the season to find our healthy eating patterns again! Big meals, sweet treats and holiday indulgences have left us all feeling full, heavy and less energetic. What better time to look for new recipes, expand your food repertoire and reap the benefits of meal preparation. We’re going to talk about the trend towards a plant-based diet and the environmental and health benefits of decreasing your animal-product intake. Going all the way meat or animal-free would make you vegetarian or vegan. But even if you can’t commit to a full-time lifestyle change, you can still experience the positive effects by making one day each week meatless. The idea of Meatless Monday was launched in 2003, in an effort to decrease our animal consumption by 15%. It was a public health initiative with a global goal of improving both personal health and the health of the planet. What it means in your own house is to take one day a week and not eat meat/animal products. How difficult could it be?! A major hurdle for some is the dinner menu. Many of us grew up on meat & potatoes, or planning your supper around the main event: the meat. Grilled chicken, pork chops, roast beef, poached salmon… the list goes on and on. To help you plan a dinner without meat, the idea is to think backwards about your meal prep. Instead of your animal being the centre-piece, think about 1 or 2 vegetables done exactly how you like them. Roasted brussel sprouts, cauliflower or sweet potato. Grilled broccoli, red peppers or zucchini. Carrots in butter with cinnamon and maple syrup. There are so many! Then think about turning some of your favourites into a meal. Toss the roasted brussel sprouts into some rice pasta and combine with pesto. Take a few roasted or grilled veggies, chop them up and add to a bowl of rice. Add some seeds, your favourite dressing or sauce and you have a hearty rice bowl great for a cold night or a post-workout meal. Trying new recipes is one of the benefits of deciding on a meatless monday, and if you think veggies first instead of the meat, you’ll easily come up with some new family favourites! For some people, the issue is flavour. They don’t enjoy veggies, grains or starches as much as they like the taste of meat. Quite often the problem is they don’t treat their side dishes the same as they do their favourite cut of steak. Marinading, tenderising, seasoning and serving with flavourful toppings is important to your meal prep with or without the meat. Try some flavourful add-ins when making your vegetarian dishes: be sure to season with salt & pepper, or herbs like oregano, smoked paprika, powdered garlic, and chili peppers. Toss in olive or sesame oil before cooking. Sprinkle with some strong flavours like crumbled blue cheese or feta, chopped pickles, sauerkraut or kimchi. And add texture like croutons or pumpkin seeds. All of a sudden your side dish will feel and taste like the main event! Avocado Toast, sprinkled with chili flakes and sea salt. Drizzle with balsamic vinegar! Winter is a great time for soups, and you can find thousands of online recipes for veggie-based soups and stews. Pair with toast topped with avocado, balsamic vinegar and salt & chili flakes and you have a filling meal in less time than it takes to defrost your meat. Whatever meatless recipes you experiment with this new year, think a VARIETY of COLOUR. Remember how good it is for you, for animals, and for the planet. Give it a try - you’ll be surprised how good you feel for so many reasons! What have you heard about stretching? Should you do it before or after exercising? Does it reduce the risk of injury? Should I do it even if I don’t exercise? What are the benefits? Stretching has long been thought of as a great method to warm-up and to reduce the risk of sustaining an injury during exercise or activity, whether it be sport or personal health related. These ideas are old and hold minimal merit according to the more recent research. We should understand that there are 2 main types of stretching: static and dynamic. Static stretching is performed by bringing a muscle to near-maximal length and holding it for a period of time in attempt to improve its extensibility and your overall flexibility. On the other hand, dynamic stretching is performed by rhythmically bringing a muscle to near maximal length and shortening it again during a movement. Examples of this would include repetitions of lunges and squats. This type of stretching differs from static in 2 fundamental ways - there is no holding of any position or pose and you are required to activate muscles in order to return to your starting position. It should be noted that static stretching has been found to temporarily reduce muscle activation potential and therefore may actually increase your risk for injury as those muscles would be less able to to protect or maintain the integrity of the joints they work upon. Furthermore, short-term static stretching may result in temporarily tightening a muscle more than it originally was thus negating its primary purpose - improving your range of motion for warm-up. Dynamic stretching, however, has not only been found to improve range of motion, it also functions to prime and warm up your muscles for action. Simply put, your body is much more forgiving when it comes to improving muscle pliability if movement and muscle activation are incorporated into the warm-up routine. Combining the benefits of improved flexibility and primed muscles makes Dynamic stretching is a great way to prepare for exercise. But hold up! There is still a place for static stretching. Long-term static stretching will impart changes to your muscles, tendons, ligaments, and joint capsules. Assuming you are well hydrated, longer periods of stretching that are performed more frequently (daily or multiple times a day) will result in longer-lasting improvements in flexibility. Many rehabilitation programs will incorporate static stretching as a means to maintain an ideal muscle length after an injury or surgery. Static stretching may also be used after exercise as a means to encourage blood flow and prevent any potential cramping that may occur. Otherwise, static stretching is largely employed in order to achieve any long term goal of improving range of motion, a very important part of functional movement! Ever find yourself getting sore for no particular reason? You’re not alone. I hear this a lot working as a physiotherapist. Many patients I see, report pain without a mechanism of injury (i.e. impact, fall, etc..). People will attribute these pains to age, “wear and tear”, poor posture and repetitive tasks but ultimately what it comes down to is poor movement patterns. Movement patterns are simply the way your muscles work together to produce a movement. I find it helpful to relate the human body to a computer. Like a computer we have hardware, these are the physical parts; the bones, ligaments and muscles that hold us together. We also have a software, this is the nervous system. This system includes our brain, spinal cord and peripheral nerves. Every time we move, a signal is sent from the brain to the peripheral nerves which activates our muscles. Top save processing time, our brains sends a motor pattern of signals instead of individualized signals to each muscle. This motor pattern outlines which muscles should fire and coordinates their firing sequence. As an example, grabbing a glass of water requires our core muscles to stabilize our trunk to hold us up against gravity, our shoulder flexors to reach our arm forward, our triceps to extend the elbow, our wrist extensors put our hand into position to grab the cup and our finger flexors to grip the cup. All of that and more just to grab a glass of water. Returning to the computer analogy, motor patterns can be thought of as the output of our software (i.e. nervous system). Input, is comprised of sensory information. This includes but not limited to vision, hearing, taste, smell, temperature, touch, pressure, vibration, body awareness and pain. Our bodies are continuously collecting sensory information from internal and external sources and delivering it to our brains for interpretation. Furthermore, each of these senses has the ability to influence outgoing motor patterns, especially pain. When there is a noxious stimulus (i.e. a pain receptor becomes activated), the body will compensate and alter movement patterns in a way to minimize pain. As an example, let’s say you wake up with a stiff neck which makes turning to the left painful. To minimize pain and make left rotation easier, you slightly elevate your left shoulder. Depending on how severe the neck pain was, you may repeat this altered movement pattern for some time. Eventually the neck pain will subside but in this time, you have trained your shoulder to act a certain way in order to compensate for the former neck pain. Down the road, your shoulder may develop an injury without a direct mechanism. This is one example but these compensations occur everywhere in the body all the time. It is why proper rehabilitation of old injuries is crucial in preventing new ones. Ultimately, motor patterns involve a number of muscles in a coordinated sequence. If that sequence is altered consistently through compensation it can lead to muscle imbalances and potential injury over time. Everyone has muscle imbalances but, not everyone has pain. So, when do muscle imbalances lead to pain? Pain is an unpleasant sensory and emotional experience associated with actual or potential tissue damage. It is a warning signal to the brain that there is a problem. However, pain does not tell you what the problem is. As a physiotherapist, I work to identify painful & dysfunctional movement patterns and analyze them to determine which muscles are “working too hard” and which muscles are being “not firing”. Through a combination of movement assessment (SFMA; selective functional movement assessment) and manual muscle testing (NKT; Neurokinetic Therapy) I am able to identify specific relationships or pairings between overworking and underworking muscle groups within a movement pattern. Once identified, treatment becomes simple; stretch or release overworking muscles and activate underworking muscles. This reprograms the dysfunctional and painful motor patterns and with repetition creates lasting change in movement efficiency. To summarize, our brain is responsible the for the coordinated movements that our muscles make. Our brain also uses sensory information to guide these movement patterns. Pain can change the way we move leading to compensations and muscle imbalances. These muscle imbalances can lead to poor/dysfunctional movement patterns causing seemingly unrelated injuries. To relieve pain and correct muscle imbalance, it is important to identify specific muscle relationships and correct the dysfunctional pattern. We must repeat this new pattern for our software to learn it, thereby reducing pain and minimizing risk of future injury. Lemon Poppy Seed Loaf - with substitutions and improvements! Below is one of my favourite loafs to bake - it has ingredients you feel good about and a light flavour to enjoy as a dessert or snack. I've listed the recipe as is, and put substitutions beside that I like and have tried. You can use some, all or none of these improvements to increase fiber and protein, remove animal products eg. dairy, eggs, or make it 'challenge-friendly' for you and your family. Enjoy! Cream butter and sugar in large bowl with electric mixer. Add eggs, yogurt & vanilla; mix until combined. Combine flour, baking powder, poppy seeds and lemon zest in medium bowl. Add to egg mix, combine until smooth. Pour into loaf pan lined with parchment paper. Bake 40-45 mins at 350 degrees C. Let cool 15-20 mins before removing from pan. This time of year it's common for people to miss days of work or school because of colds and flu. There are many contributing factors to this phenomenon, including the weather, shorter days (less hours of daylight), increased contact with other people during the holidays, more time spent inside and more. We often get asked: "how can I avoid getting sick this time of year?" There are various ways to prevent sickness, and we are going to focus on the things you can do at home. This means 2 things: decreasing your contact with "germs" (bacteria & viruses that cause sickness) and strengthening your immune system (your body's natural defense system that fights the illness once you've had contact). Hand-washing is one of the top recommendations for avoiding sickness. We will come in contact with many bacteria and viruses during the day, through contact with other people and touching things that other people have touched. Door handles, railings, items in stores, tables and electronics at work or school... our hands are constantly picking up germs left by other people. Although we can't fully avoid this, we can remove many of those pathogens before we put our hands on our face, in our mouth/eyes or touch anything around the house to pass them on. Washing your hands when you get home from work, school or shopping is important. If you are in contact with people during the day, make sure to wash your hands often and in between, and definitely after you use the washroom. Soap and water are good, and rubbing your hands together well is effective for removing the germs. This is one of your best defenses for preventing illness-causing bacteria from getting inside of you. We can't prevent every last microbe from getting into our bodies. So what happens once they're there?! Our body has a built-in defense system, called our Immune System, that works 24 hours a day to fight pathogens once they're inside. How well our immune system works, though, depends on many factors including things we can do to take care of it. Things that significantly boost your immune system function: 1) Sleep - as much as you need, 2) Healthy Food - fruits & vegetables, 3) less Stress - decreasing the source or learning ways to manage it. I'm sure you've noticed that if you are missing any of these things you are more likely to get sick. Our body has the best chance of fighting illness if the immune system is working at maximum capacity. Make your health a priority and you will avoid getting sick during this year's 'cold and flu season'. Wishing you good health in 2018! Yes it's Fall, and the star gourd of the season is the mighty PUMPKIN! It's everywhere - in your treats, your dishes even your coffee! When trying to ingest as much pumpkin as you can this month, it could start you onto that slippery slope of too many treats leading into Holiday Season. Below we're re-printing two of our very favourite PUMPKIN RECIPES to get you into the mood for baking and cool weather, without the extra guilt. Pumpkin itself is a great fruit/vegetable: it is packed with vitamins and minerals and low in calories. It's high in beta-carotene, which is converted into Vitamin A in the body. It is also a great source of fiber, potassium and Vitamin C. All these nutrients work in the body to regulate blood pressure, reduce cancer risk, manage diabetes, and improve the immune system. Our recipes below use canned, pureed pumpkin/squash. This is NOT the same as 'pumpkin pie filling' as it is unsweetened and contains no other ingredients. 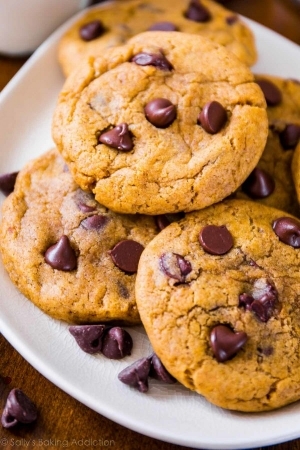 A specialty this season, these Pumpkin Chocolate Chip cookies are moist and sweet. We make them with rice flour to avoid gluten, and with reduced sugar content. I double it up and freeze the dough so you have some ready for baking at any time. form dough into approx 1/4 cup mounds and flatten onto a parchment lined tray. Cover with plastic wrap and refrigerate for 3+ hours, up to 5 days. Dough at this stage can be frozen airtight up to 4 months, to be baked when you like! Bake at 350 degrees for 12-14 mins. This is one of the best ways to use the extra canned pumpkin you have from your cookies! It is simple, no cook and challenge-friendly! I like to serve it with frozen raspberries sprinkled on top. Add all ingredients to a bowl and mix with a spoon. Store in refrigerator and enjoy! One of our regular questions in the office - what can I do at work or at home to improve my posture and prevent slumping? Proper body posture has to do with alignment: ears are over shoulders (not in front) and shoulders are over hips (not rolled forward). For some people their pecs (chest muscles) are too short and tight, making it difficult to pull the shoulders back. Other people have weak back muscles that are unable to hold your spine and head in the right position all day long. And some have limited movement in their spine, specifically the upper back or thoracic region, which prevents a neutral alignment. 1. Make sure your desk is set up correctly. Use the diagram below as a reference. 2. Stretch your chest/front of your shoulders. 3. Strengthen your upper back. You can use exercise bands if you have them, or simply squeezing the shoulder blades together will work those muscles. One useful tool for people with chronically poor posture is the Posture Medic. This simple device has 3 uses: you can use it to stretch, it's an exercise band you can use to strengthen, and you can wear it to help improve your posture when you have long hours at the computer or working. Ask Dr Scott or Dr Taia about a Posture Medic device - once sized they can be ordered for you! The more I work as a physiotherapist, the more parallels I draw between the human body and a car. Like a car, the human body requires fuel for energy and locomotion. Both contain an electrical system, which delivers signals between parts. Each one is also composed of a framework or skeleton. Whereas a car relies on a drivetrain to move, the muscular system is responsible for maneuvering our skeleton to produce movement. At first glance, human motion may appear uniform across all people. However in actuality, each person moves around this world a little differently. There are 600+ muscles in the human body and within each individual there is variance in how these muscles function together to produce larger movements. This variance is largely a product of our habits and environments. Postures, occupations and types/amount of physical activity all influence our movement patterns. Injuries, large and small, can also affect our movement patterns and ultimately our framework. Let’s go back to the car analogy. You are parking your car and hit a curb. On the exterior there is a small scratch, which is easily buffed out, but on the inside, the car’s alignment has slightly shifted. The car still drives fine but over time this alignment shift affects your car’s overall performance (i.e. reduced handling and gas mileage, increased tire wear, etc…). You continue to drive the car as normal, and then one day the car blows a tire. What may seem like a fluke was actually a result of poor alignment. This example translates directly to the human body. Pain changes the way that we move, whether it is conscious or unconscious. If not rehabilitated correctly, these changes in movement patterns can lead to joint wear, poor movement quality and further pain. As an example, an ankle sprain may cause you to reduce weight bearing through the affected leg. Over time, the ankle pain subsides but now you become more comfortable bearing weight through your unaffected leg. Over time, pelvic alignment changes and you begin to feel back pain. A physiotherapist is trained to help identify movement dysfunctions like this and address the source of the problem, not just the symptoms. Through a combination stretching and strengthening exercises, movement patterns can be corrected allowing muscles to regain their proper function. As a result, your body can “drive” you through your day-to-day life while reducing the risk of future injuries. If you have any old injuries you'd like addressed, or new ones that you have no idea where they are coming from, it might be time for a 'scan & assessment'. Many people ask us this question every week, and the research and advertising you hear can be very confusing. Sometimes we're told "you must take them daily" and other times they say "vitamins don't do anything except make expensive pee". How are you to know what to do?? First of all, like any health advice, you can't take a stock answer. Everyone has different needs and health concerns and what is right for one may not be right for another. To start making your decision, you may need to decide what your goals are. Here are the reasons we do recommend a multi-vitamin: 1) taking a multi-vitamin sets up a daily, healthy habit. From here it becomes easier to begin/add other healthy habits (drinking more water, getting enough sleep, exercising regularly etc.) 2) We often don't eat enough (of the right things). Busy lives often leave us eating out, quickly grabbing food and not thinking about the balance and variety. Weeks and months can go by with us missing certain groups of foods and important vitamins and minerals as well. 3) the food we have access to is less nutritionally dense than it was years ago. Cooking decreases the nutrient value, as well as the soil it is grown in often contains less of the "good stuff". 4) boosting our bodies with vitamins and minerals greatly improves our immune system. When our immune system is working better, we have less sickness, less allergies, better digestion and better healing time. Your chiropractor is a champion of helping you boost your immune system, both with things you can do from the outside and things from the inside. Does it matter what kind of MultiVitamin you take? They can get expensive, and are often something we will go without if trying to cut costs. The quality of products will definitely range from high to low. There are guides that can help you decide if the vitamin you use is worth the money. There are books, like the Comparative Guide to Nutritional Supplements, McWilliam 2003 and others that gather evidence not based on marketing but on product testing. You can ask your Naturopathic Doctor, your Chiropractor or your Physician if they have products or brands they recommend. Here at the ProActive Centre, we recommend and use the Progressive Nutritional multi-vitamin line. These products are of good quality and are at an excellent price point as well. They are formulated with the assistance of a Naturopathic Doctor, and are manufactured in Canada. They offer different multivitamins for men and women, for active persons and for those 50+. And the company donates a portion of their proceeds to the David Suzuki Foundation to help combat climate change. What is not to love?! Why would I visit a Chiropractor? For people who have never seen a Chiropractor, this is a common question. What do they do? Why do I need to go? How often and for how long do I need to see them? First thing to note is that people see Chiropractors for a variety of reasons. For some people it's to take care of an injury. Injury care is very common in many chiropractic offices today, with people coming in having hurt their back, getting headaches, sprained an ankle, pulled a muscle, etc. Sometimes it's for a nerve problem - sciatica, carpal tunnel syndrome, pain going down the arm...! These are all issues a Chiropractor can address. Our motto here at ProActive Chiropractic is "from headaches to ankle sprains, and everything in between!" Doctors of Chiropractic are specialists in physical injury (otherwise known as musculoskeletal) complaints. They are experts at testing, diagnosing and recommending treatment for any injury to the body. They are also able to refer you to the correct specialist if need be. A treatment for injury will usually involve a series of visits within a few weeks to address the injury, allow time for healing and to adapt the treatment as you improve. The point of these visits is to speed up the healing process, to manage any pain or discomfort, as well as prevent this type of injury from happening again. Another reason people visit their Chiropractor is to address physical issues on a regular basis. A chiropractor specializes in all things musculoskeletal and is a leading expert on the spine. Some people don't pay much attention to their spine. You can't see it, and if you don't feel anything wrong you might assume there's nothing to be done. Realizing the importance of treating the spine lies in understanding its function. Our spine keeps us upright and absorbs the forces we place on our bodies, from walking to driving to lifting etc. It is the place where a significant number of our muscles attach and this translates into both movement and stability. Also important is its function of protecting our spinal cord, and thereby our nervous system. The spinal cord comes down from the brain through the spine itself. The nerves that go to the organs, muscles, skin and joints all come from the spinal cord. The spine and our nervous system, therefore, have a very intimate relationship. It can be argued that the better our spine functions, the better our body functions because it allows the best possible environment for our nerves. Spinal adjustments, then, can not only release stiff or restricted areas of our spine, but can have benefits on the body such as muscular relaxation, a decrease in pain and improved posture. If our nervous system functions better because of the spinal adjustments, the systems it controls will also function better eg. digestion, blood pressure, immune system etc. This type of chiropractic visit might happen on a regular basis, but at a time frame that works for you. We find some people like their visit every other week, some come in once a month and some may be less frequent than that. Everyone's body is different and requires a unique amount of "maintenance". Finally, many patients will consult their Chiropractor about other health concerns. A Doctor of Chiropractic is a Primary Health Care provider and could be the first person you see about certain issues, to determine whether you need a GP visit or potentially to see another specialist. Many Chiropractors have a special interest in both nutrition (and supplementation for health) as well as exercise. We are here to help you make changes, suggest solutions to certain health issues, or to recommend and implement exercise, whether it be injury-specific, getting into a regular routine or improving your level of fitness. Edison said: "The doctor of the future will give no medication, but will interest his patients in the care of the human frame, diet and in the cause and prevention of disease." Chiropractors believe and work within this model of preventative health care. Your ProActive Chiropractors are more than happy to discuss any of your health goals and help you achieve them. Being pro-active about your health means you will live better, and isn't that what we are all looking to do?! Sitting is the new smoking... is it possible to quit?! According to the research, more and more evidence suggests that a sedentary lifestyle increases our risk of morbidity and mortality. Simply put, excessive sitting increases the likelihood of poor health outcomes. Fortunately, most people have caught on to this. Many of us now try to squeeze whatever activity we can into small compartments of our workday. The question then becomes; is that brisk walk over lunch enough to counteract time spent sitting each day? Interestingly enough, a few others also asked themselves this question. After reviewing current research, authors of a 2015 review paper concluded that sedentary time was independently associated with poor health outcomes, regardless of physical activity. In other words, that lunchtime walk is a great start, but not quite enough. This is where health care professionals can come in handy. For example, as a Physiotherapist I begin each assessment with a detailed history taking. This is a very important step where I learn about each patient’s medical history, occupation, exercise habits, recreational activities and environment. Questions about lifestyle and daily routine are very helpful in understanding the environment in which our musculoskeletal system exists. Would you place a plant in a dark basement all day and expect it to thrive, regardless of giving it adequate water and soil? The same should be considered for our bodies. Several minutes of stretching, or 15 minutes of walking hardly combats 10+ hours of sitting each day. That is why it is important to consider modifying our environment to allow for optimal health results to be achieved. Little changes such as 5 to10 minute stand and stretch breaks every hour can go a long way in terms of cutting down on total sedentary time. To conclude, it is not my intention to have you stop your current physical activity program, or health initiatives. Rather, I hope this offers insight about considering your environment as a whole when optimizing your health. Work with a health care professional to identify environmental factors that may limit your ability to achieve your goals. Consider lifestyle changes in addition to your daily program modifications. Most importantly, don’t be victimized by your calendar. The human body craves movement; consider making it a regular part of your day. -Daniel Caterini MSc, MSc(PT), Sport Physiotherapy Cert. The term "exercise" has the ability to polarize people; some seek out exercise articles, new trends and different programs, others shut off once they see the word. As a Primary Care Physician, one of my main concerns is to interest people in regular movement both for injury prevention and overall health benefits. The reasons I'm given, for people choosing to avoid exercise, are many: no time, never liked it, have an injury, too expensive, don't want to bulk up, doesn't help them trim down, not already skinny, not already muscular, don't know how, hate gyms, etc. etc. etc. No matter how many articles, blogs, blurbs and commercials are written, it is still my (and all other health professionals') responsibility to continue promoting exercise as a lifestyle. It's my job to encourage movement not for looks, but for overall health. For those who think they don't have to exercise, I compare daily activity to brushing your teeth. Regular tooth-brushing is something that is taught by parents from young. As a toddler, you don't WANT to brush your teeth. However your parents make you do it, every day, for the reasons that it's good for you, you want to prevent cavities, you want your teeth to look nice, you don't want food stuck in them, and further down the road you want to prevent gum disease, gingivitis and heart problems. Exercise is very much the same. Most do not WANT to workout, but it should really be taught from young up; you want to feel and look better every day. You want to prevent future heart attack and stroke risk, as well as diabetes, osteoporosis and high blood pressure. You want to increase life expectancy, and to enjoy life more. The excuses that try to over-ride these reasons are from the inner toddler in us all, who wants to say "NO, I don't like that!" to the adult we are today. If you are in the group who hates it, or who doesn't regularly make time for physical activity, my advice is to just do something. Walking for 10 mins 2x/week is better than nothing. Curling your grocery bags 10x before putting them on the counter is better than nothing. Going faster up the stairs is better than nothing. Sometimes the hang up is that if you can't look like a Nike commercial, it's not worth it, and nothing could be further from the truth. Finding things you can do all the time can be better than running a marathon or pumping iron at the gym. If you are someone who already maintains some level of activity and has a more specific goal in mind (weight loss, sport-specific training, competing in an event) that is the time to pursue a more disciplined training program. Having someone help you focus on your goals and set a training plan to make sure you achieve them is key. Group Fitness Classes are extremely popular here at the Training Centre. They offer expert level coaching and encouragement to work, with a fun atmosphere surrounded by other people. We have HIIT training (high-intensity interval training) in the form of TABATA and Body Burn, and a full-body program in the form of SplitFit (circuit training, spin bikes and TRX) as well as other favourites like Bootcamp and Stretch Classes. In the end, humans need activity. It's not just a hobby for the fitness fanatic. Our body performs better and gets sick less when we are active. Almost any condition is improved with exercise. Just pick something you hate the least, and do that. We are here to help! Happy New Year! Most of us spend the late holiday season reflecting on the last year and dreaming for the new. The ProActive Centre had a big year of change in 2015, and we thought we'd share some of the highlights with you! *We switched to organics recycling for our treatment rooms; reducing the overall waste of the Centre by up to 75% by volume! *Therapy Ball (Yoga Tune-Up self-massage) courses are now being offered through the Training Centre... with 2 sold-out courses held this past fall. Next workshop is Thursday January 21st at 7pm! *We've added more treatment rooms & new tables to the clinic, offering more times for treatment with your favourite chiropractor or therapist! The Training Centre has new equipment & weights - lots of room for classes in the New Year! Thank you to all our wonderful patients and participants who choose us to guide them in making healthy lifestyle improvements. 2016 is a fresh start, and possibly time to make a new class part of your routine, or to schedule treatment for an injury that holds you back. We wish you all a healthy, successful start to the New Year! I recently got to experience my first massage using Hot Stones. I didn't know what to expect, but I was thinking things would be different from my usual experiences with Registered Massage Therapy. I was right, and wrong, and pleasantly surprised all at the same time. My treatment was with Alex Farrow, RMT. She asked me to get set in the usual way, under the warm sheets in a dim-lit room, down to my athletic shorts or underwear. The massage itself started off the same as I am used to - warmed lotion massaged in a general way along the back, shoulder and neck muscles. She then placed some warmed stones on my calves and palms; they were light yet solid, and warm but not hot. Next Alex used other warmed stones in her hands to massage the back, neck and shoulder muscles. It felt the same, but different! Warmer, deeper yet not uncomfortable as you might expect. During the treatment she alternated between more superficial and deep tissues, using a combination of her hands and the warmed stones. Hot stone massage is an example of Geothermohydrotherapy, or the therapeutic use of stones that are heated or cooled. It is a combination treatment using both massage and placement spots of Basalt Stones. These tools have above average heat retention, as they are made from lava, cooled following volcanic eruption. You will notice their dark, black colour if you get a chance to see some up close. The benefits of hot stone therapy include an increase in circulation due to vasodilation, an increase in relaxation associated with a decrease in stress, decrease in pain (joint, muscle) as well as headaches, and an increased feeling of well-being. I definitely recommend trying Hot Stone Therapy, especially during the upcoming months of cooler weather and increased holiday stress. Alex is currently accepting patients, why not try a Hot Stone Massage when the weather is cold and the room and stones are warm?! School's back and we're returning to long hours either studying or at the office. For many of us, work includes a desk and computer. This sometimes means neck pain and headaches, both of which can be avoided. There are some relatively simple ways to reduce computer-related headaches and make your computer desk a more comfortable place to be. Chair set-up is important. You should be able to sit on your chair with your back against the rest and your knees no higher than your hips. Feet should be flat on the floor and if you are shorter, use a lift so they don't dangle. An arm-rest is ideal to keep the elbows at 90 degrees and to support your shoulders (reduce tension) as well as your wrists (straight is best). Some people like a lumbar cushion added to their chair to help maintain the proper curve of their low back and to make proper posture easier. Where you position the monitor is very important to keeping your neck and head pain-free. Most people have their monitor too low, and are looking down for the majority of the day. As the above diagram points out, the top of the monitor should be in line with your eyes or even a couple inches above when your are looking straight ahead. The monitor and keyboard should be close to you to avoid forward slouching. Laptop users beware: the screen is usually sitting very low when working and over time this creates poor posture and often headaches. For long periods of use make sure you are set up at a table that allows you to see the screen without slouching, and consider angling the screen upwards. If you have neck pain or headaches that come on at the end of a work day, or can be reduced by movement or changing position, your posture may be affecting your health. Consider adjusting your work space; you can also consult your Chiropractor for postural recommendations, exercises, or treatment if necessary. Summer is here, and we're all more active, enjoying the outdoors, and probably wearing less clothing than we'd wear the rest of the year. In addition to all the BBQs and ice cream cones, you're probably looking for some lighter meal ideas for yourself or your family. I'm going to share a few of my favourite "light but flavourful" food recipes. A quick salad can be made with one of those pre-packaged coleslaw bags from the grocery store. Whisk a simple dressing: 1/4 cup vinegar (apple cider or red wine), 1 tsp dijon mustard, 2 tbsp apple juice or maple syrup, 1/8 cup olive oil and salt&pepper to taste. Put the pre-cut coleslaw mix in with your dressing and let sit 1-24 hours. Makes a great side dish/salad, or a tasty filling for rice wraps. Rice Wraps (often used in cold rolls at Thai restaurants) are inexpensive and a great gluten-free summer snack maker. They come dry in a round disc in the international section of the grocery store. Take out the number you'd like to use, and soak in a larger bowl of water for a minute. Once softened, take out one at a time and lay on a dry cutting board. Fill with your favourite ingredients and wrap tightly like a burrito. If you leave them a couple minutes once wrapped, they stick together. Try using the leftover coleslaw, lettuce or other greens, last night's grilled chicken or other protein as fillings. Perfect for lunch or hot sticky summer nights! Mexican night is one of my favourites. It's filling, flavourful and can have as many items as you like. Start with rice and beans (maybe cooked together, maybe separately). Dice veggies into a salad (romaine, cilantro, tomatoes, cucumbers, avocado). Your protein could be white fish, simply baked, or ground turkey stirfried with lentils or onions/garlic/ginger. Top with salsa and you have a tasty dinner for everyone! Enjoy your summer, and in between the ice creams and BBQs, try some tasty fresh dishes that feel light! I'm just finishing a 10-day metabolic cleanse, or detox, and I feel great! Ten days to some people sounds too long, and some people might ask 'how can anything change in only 10 days?'. I am writing to record my impressions (and those of my husband, who did it too) for anyone curious to try such an endeavour. First off, I will explain that this was the Metagenics Clear Change program. I found it easier to do than other programs I've tried (Dr. Oz 3-day cleanse, 8-week challenge, etc). I never felt hungry, and cravings were minimal. Today, on day 9, I walked by a fast-foot restaurant with delicious smells wafting past me in the parking lot. I was able to acknowledge that it smelled good without any pangs of hunger or desire to have some. I then went to the grocery store, supposedly to find "treats" that I had been denied over the past nine days. I came home with nothing except the same foods I have been eating. I'm just not interested. It is called a metabolic cleanse, designed to improve the functioning of kidney and liver, with the aim to rid the body of toxins (from the environment, air, foods, etc). As our liver is integral to digestion, this claims to help GI symptoms as well (bloating, gas, indigestion). To be honest, I did it to lose weight. To get rid of the stomach, to not feel so full and bloated after meals. Mostly to get smaller. Days 1 and 2 were fairly simple, as it was really just clean eating. They even give you a handy booklet in your kit with meal & snack suggestions. The day before we started I went to the grocery store armed with this booklet and picked up everything we needed. If I can stress anything about this detox, and beyond, it's that PREPARATION is the key. It wasn't hard or much more time consuming than usual, but advance planning at the grocery store and in the kitchen was necessary. The second way I prepared was by removing anything from the kitchen that wasn't on the cleanse. Why look at it if we couldn't have it?! I put a plastic bag around anything in the fridge or freezer we weren't going to be using (other meats, drinks with alcohol or sugar, off-limits condiments). I put any cupboard products (wheat-based crackers, granola bars or cereal) in a bag in the basement storage. Then when we went to the kitchen for a meal or a snack, anything you could see you could eat. An excellent book by Harvard Researcher Shawn Achor explains that our willpower weakens the more we use it, and that we are constantly pulled towards the path of least resistance. So, he posits, why not put our goals IN the path of least resistance ie. make what we want to happen, the easier choice? By having only the "good food choices" available and having meals prepared ahead of time, the easiest choice in the kitchen, is that which is already there! The kit comes with a shaker cup and tub of UltraClear powder, to be mixed with water and/or apple juice and drinken 1-4x/day (depending on the day). It also comes with a bottle of Advaclear capsules with antioxidants and compounds to aid in the organ detox. I was warned it's classified as "medical food" and not designed to taste like a milkshake. True story. The first day I tried it with just water. It tasted like bad sand in a glass. After a day, though, (and some apple juice for flavour) I became used to it, and today I am willingly having the shakes throughout the day. I'll be sad when the tub is gone. It's filling for a couple hours, and feels great in the stomach. After the first couple days of craving my favourite foods, it became almost easy to continue eating the suggestions in the booklet. Some noticeable changes: you pee alot more. I will assume that's the kidney's function improving. No full/bloated stomach feeling by the end of day. Sleep is good. My husband reported a significant improvement in injury-related pain. Weight loss; my husband lost almost 10 pounds. I lost 3. I feel, however, significantly smaller around the middle and all my clothes are much looser. I'm happier with that than seeing a double-digit loss on the scale. Overall an excellent program, one I would consider doing yearly to improve my digestive system, organ function, and just to feel great. If you have questions or if this is something you would like to try, conctact Drs. Scott or Taia for more info. This week we were honoured to offer a FREE seminar on Digestive Health. Patients were invited to attend this information session on common 'stomach' problems and bring questions for our speaker, Stefania from Metagenics Canada. Firstly we learned that the lining of our digestive tract can become damaged in many ways, from poor food choices, to allergens (food or environmental), to chemicals we are exposed to in our homes (cleaning supplies) and the air, and finally from medications (antibiotics, NSAIDs like ibuprofen and more). A chronically damaged gut-lining becomes "leaky", meaning items that are supposed to be broken down first will pass through whole, and as such can cause damage not only in our digestive tract but throughout the whole body. Unknown to many people, the health of our digestive system is directly related to other systems of the body and gut dysfunction can lead to many chronic diseases like IBS, Crohn's or colitis, allergies, diabetes, eczema, arthritis, and more. Alternatively, many factors can damage the bacterial environment of the digestive system, causing other digestive problems like bloating, gas, cramps, constipation and/or diarrhea. Antibiotics are a known cause, as is a poor quality diet. Stefania suggested many natural solutions, including stress management, chewing slowly/carefully, choosing high-quality nutritious foods, and avoiding food triggers (different for everyone but could include wheat/gluten, dairy, sugars). Exercise is also important, as well as supplementing with certain nutraceuticals, which could include multivitamins, fish oils and probiotics. For those with specific, chronic conditions, Metagenics offers comprehensive treatments and products designed to help heal the gut (root cause) thereby resolving the symptoms of IBS, diabetes, arthritis and more. Feel free to set up a time with your Chiropractor to discuss your health issues. Dr. Taia is currently taking appointments to review health assessments and set up treatment protocols to help heal your digestive problems! What is Graston, how does it work, and is it for you?